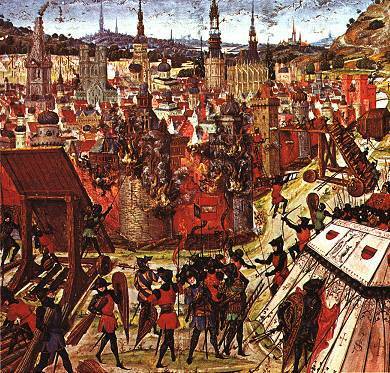 The Siege of Jerusalem took place from June 7 to July 15, 1099 during the First Crusade. During it, the Crusaders stormed and captured the city from Fatimid Egypt. The Siege is notable for the massacre that followed, during which much of Jerusalem's population was slaughtered. After the successful siege of Antioch in June 1098, the crusaders remained in the area for the rest of the year. The papal legate Adhemar of Le Puy had died, and Bohemund of Taranto had claimed Antioch for himself. Baldwin of Boulogne remained in Edessa, captured earlier in 1098. There was dissent among the princes over what to do next; Raymond of Toulouse, frustrated, left Antioch to capture the fortress at Ma'arrat al-Numan in the Siege of Maarat. By the end of the year the minor knights and infantry were threatening to march to Jerusalem without them. Eventually, on January 13, 1099 Raymond began the march south, down the coast of the Mediterranean, followed by Robert of Normandy and Bohemond's nephew Tancred, who agreed to become his vassals. On their way, the Crusaders besieged Arqa, however the Crusaders failed to capture it, abandoning the siege on May 13. Fatimids had attempted to make peace, on the condition that the crusaders not continue towards Jerusalem, but this was ignored; Iftikhar ad-Daula, the Fatimid governor of Jerusalem, was aware of the Crusaders' intentions. Therefore, he expelled all of Jerusalem's Christian inhabitants. He also poisoned most of the wells in the area. Further march towards Jerusalem met no resistance. Proceeding down the coast of the Mediterranean, the crusaders encountered little resistance, as local rulers preferred to make peace with them and give them supplies rather than fight. On 7 June the crusaders reached Jerusalem, which had been recaptured from the Seljuks by the Fatimids of Egypt only the year before. Many Crusaders wept on seeing the city they had journeyed so long to reach.